Sharpening images is the endpoint of the photographic workflow, be it for print or screen. However, the process is a trade-off between the desired contrast and undesirable colour shifts or artefacts. However, we can reduce the compromise through a technique called luminance sharpening, which only sharpens an images detail -- known as the luminance data. As a luminance sharpen only applies to the black and white information in an image, where the detail lives, there’s zero impact on any colour data; which reduces artefacts and colour shifts that other sharpening methods are prone too. Luminance sharpening can only happen in the LAB mode. LAB’s channel make-up has a critical difference to RGB that allows this type of sharpening; LAB mode creates separate channels based on detail (luminance) and colour, rather than combining them as in RGB. By isolating luminance data in a single channel, LAB allows us to target sharpening exclusively onto that detail information. By contrast, RGB’s channels contain detail (luminance) and colour mixed bundled together into each channel (red, green and blue), so it is not possible to target one without affecting the other. To convert into LAB mode is simple, we go to Image >Mode > Lab Color. You are now in LAB mode. Open to the channels palette, and you will see your new channels of L, A and B all selected. Next we must select the Lightness channel in order the sharpen directly onto the detail information of our image, this is opposed to the layer view, which is common to most other sharpening methods in RGB -- like the High Pass. 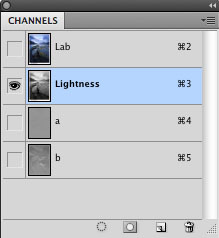 Open the Channels Palette, select the Luminance channel, your image will now go greyscale -- revealing the detail data view. 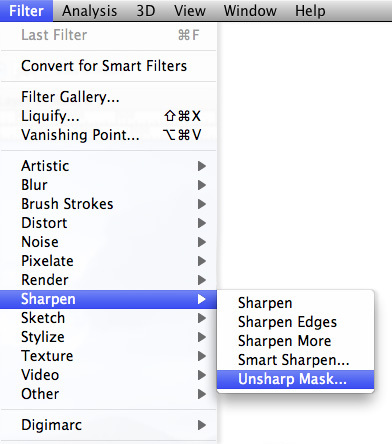 To apply the sharpen go to Filter > Sharpen > Unsharp Mask to activate the Unsharp Mask dialogue. The options in Unsharp Mask may look confusing if you are not familiar, here’s a quick breakdown of what they all mean. How light the lighter pixels get, and how dark the darker pixels get. When sharpening the image, the edge or border between two colours Unsharp Mask makes light pixels lighter and dark pixels darker. Set it too high and your picture will look grainy and too contrasty. Simply, the area that will be sharpened. A low radius means only the pixels right next to the edge will be sharpened. A high radius means a wider area will be sharpened. Setting the radius too high will produce weird outlines or halos around your edges. Not good. How much contrast there needs to be between colours for them to be sharpened. A higher threshold means higher contrast areas will be sharpened, but low-contrast areas will not. Sharpening low-contrast areas (like a clouds) will introduce grain and speckle. With your chosen settings selected hit OK. All done. For those who are uncomfortable with the LAB mode, or who see this as an extra workflow step, you can do an approximate method of this luminance sharpening technique in RGB. Duplicate your final layer, then select the top layer.Apply the Unsharp mask filter as usual, intentionally over-sharpen a little. Now select the sharpened layer and change the blending mode from Normal to Luminance. 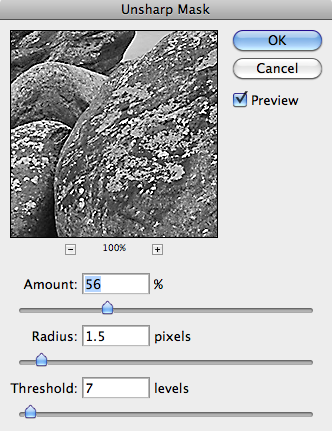 Then using the Opacity slider to reduce the sharpening layer to correct any undesired artifacts.